Slime was a product made by Mattel that simply grossed out EVERY Mom. Or most girls. 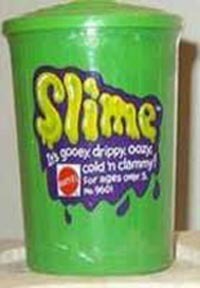 Slime was a goo made out of guar gum (a non-toxic substance used primarily as a low calorie food thickening additive, mostly for sweets and dietary products to help give you that "full" feeling) and dyed a bright glow-in-the-dark lime green colour. It's main demographic was boys because hey, we LOVED something that grossed out everyone around us. Not many girls we knew were adventurous enough to touch the stuff back then either. Moms (ESPECIALLY MINE) HATED it. "You had better not let any of that get on my carpet!" my mom demanded, thinking it would STAIN the carpet (it never did). And woe if you DID drop it anywhere. Because the biggest problem with Slime, beyond the parental, school and girl gross-out factor is the fact it was ONLY meant to be held with CLEAN hands (and boys? HA!) and NOTHING MORE. Because Slime picked up ANYTHING you accidentally dropped it on. But this was also educational as you begin a new appreciation for how MUCH dust and ick are on your floors and carpets at any given time. Or how much the pets ACTUALLY shed. And that's why it eventually grossed out boys too. Later versions of Slime came in yellow and purple colours with soft plastic eyeballs and worms.